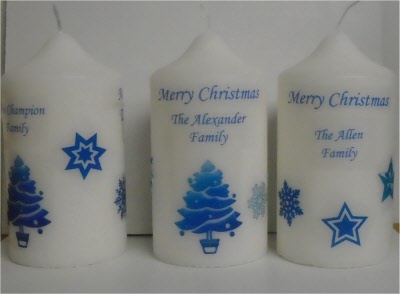 Large white pillar candle with lovely blue Christmas design around the candle in blue with modern look Christmas tree, and star designs. Fully gift wrapped with metallic ribbon. Wording on the front of the candle is " The ~~~~ Family "
Please supply the family name you wish when placing your order.